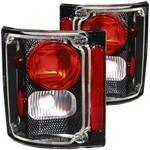 Add style to your Chevy or GMC Truck with these Custom Tail Lights from USA1 Industries. These tail lights feature a custom crystal clear lens with black housing. Add one of a kind style to your Chevy or GMC Truck with the custom carbon fiber tail lights. Sold in pairs only. These complete LED assemblies include everything you need to fully convert your trucks tail light, brake, turn signal and side marker to brighter longer lasting LEDs. Convert your existing tail lights, brake and turn signals to brighter longer lasting LED tail lights easily and cheaply.